mint coat Archives - Do You Speak Gossip?Do You Speak Gossip? These photos were taken late last month on a really cold and windy day. Thankfully the weather has changed since then, and I’m hoping that the cold won’t come back. 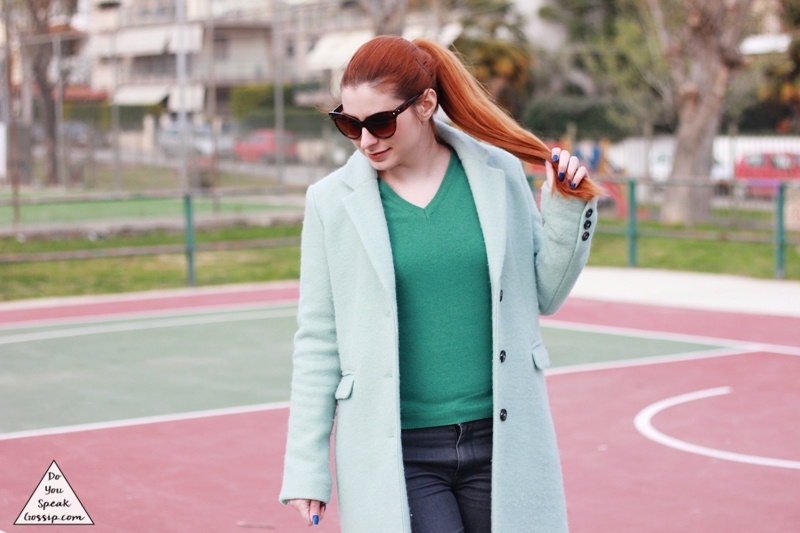 For a second time so soon, I went “sporty” again, with just a pair of jeans, a sweater, my all stars and my mint coat. Go-to uniform for all those days I’m too bored to dress up. I told you that the mint coat will be in almost every outfit from now on. Don’t tell me I didn’t warn you! 😉 Hope you like my look! I already know the answer to that question, and it’s a no. As much as I’m longing for spring, it’s still early for it to come. But we get some sunny and not so cold days already from time to time, so I jumped at the chance to dress in pastels the other day and go out to enjoy the sun. It was a bit windy, and kind of cold without my coat on, but with it I felt amazing, and as you know how much I love mint, you can imagine how happy wearing that outfit made me. I can’t wait for spring to come, and for the spring clothes and bold & pastel colors to be here for good. I had this outfit in my mind for a few weeks now, so I was so excited that I got the chance to finally wear it. What do you think?